Hà is a 10 year old girl growing up in Saigon, Vietnam, during the 1970s. She has a loving family, a best friend and her own papaya tree. But then the Vietnam War gets too close to home, and Saigon falls. Hà and her family must flee on a ship that leads them to the United States. 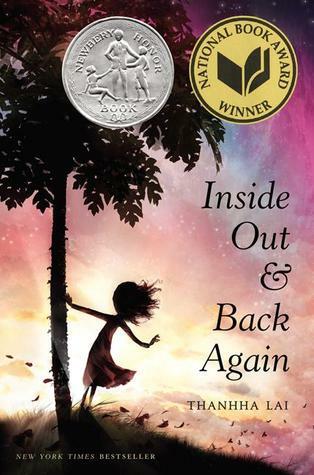 Inside Out & Back Again by Thanhha Lai is a wonderful middle grade book that introduces the Vietnam War and the struggles of refugees through verse. Told from the viewpoint of a girl who has to leave her home and try to fit into a completely different culture, the novel should appeal to young readers. My 9 year old son, C, really enjoyed this book, which honestly was a surprise to both of us! The fact that it is told in verse exposes young readers to a different type of literature, but it's the story of Hà that will resonate with readers. Here is a girl who is very bright and does well in school while living in Vietnam, but because of language barriers, she has a tough time in school in the United States. I expect that readers will be able to relate to some of her challenges and worries, and it will open their eyes to what refugees must go through when they leave their homes. I highly recommend Inside Out & Back Again. This would be a great novel for older elementary or middle school students who are learning about the Vietnam War, refugees or historical fiction in general. It's also an engaging introduction to reading stories in verse. This review was written based on a copy of Inside Out & Back Again that I purchased.